We are your personalized photo calendar experts! Our high-quality calendars are the perfect gift for a loved one, or to enjoy yourself all year long! Visit the calendar Design Centers at each store, where our expert staff are ready to help you create your masterpiece! TIP: Stop by the store for help and pointers. Or let us do the work for just $20. Simply bring your images and ideas! Choose your favorite family pics from the past year and create a yearbook. Or make separate calendars featuring each child using the past year’s worth of memories. This is a great way to share your life with distant friends and relatives. TIP: You can use any digital image in JPG format in your calendars. Dogs and cats (and birds, rodents, reptiles, etc) are family members too! Celebrate the love we have for our pets by featuring them in a calendar. If you have one photo that’s your absolute favorite, make a single page poster calendar. Or choose 12 or more pics and feature Fluffy every month in a spiral wall calendar. TIP: Get creative! Most of our templates allow you to add multiple photos per page, rotate photos at angles, and add your own text to each page. 3. Recipe Calendar – two gifts in one! This one’s for all the foodies out there. Place a photo of a delicious meal or baked good on one side, then type out the recipe or place an image of it on the other. Organize your recipes by season – salads during warms months, hearty dishes during cold months. A great way to share special family recipes! Share the past year of your (or a friend or family’s) Social Media life. You can connect to Facebook directly from our website (sorry, Facebook connect is not available at our kiosks at this time). Check out our Instagram-ready calendar templates, such as this simple calendar, this vertical style, our poster calendar, or our large 12x12 squares. Personalized calendars are a great way to celebrate a marriage anniversary or plan for an upcoming wedding. They also make a great Valentine’s gift. Include important moments, like photos from the engagement, bridal shower, wedding day, honeymoon, and past anniversaries. This gift is sure to be treasured, whether you make it for yourself or your significant other, or gift it to a very special couple. Use our single page, poster format and add one photo plus your company logo. A great gift for clients! TIP: You can also add your own events and reminders to mark important days. Remember, you can put images of anything in our calendars. Use scanned images of artwork, awards, letters, even slides and negatives – if you can digitize it, you can use it in a calendar! If you need help scanning your keepsakes, let us do it for you. There are endless ways to get creative and have fun with our calendars! Need help? Stop by a store or call 1-800-297-SCAN and one of our expert staff members will assist you. Let us design it for you! For just $20, we’ll help you put it together. Simply bring us your images and text (as a Word, PDF or text file) in the order you want them placed in the calendar, and show us which calendar template you want us to use. Easy! Buy More, Save More. 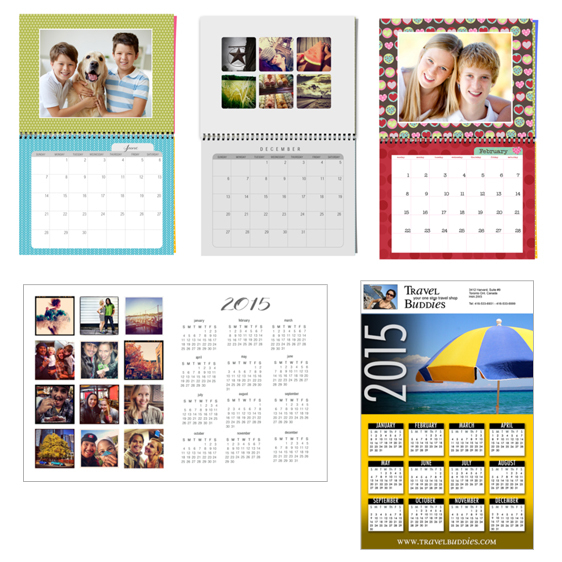 Purchase 10 or more spiral calendars and save 25%. Ready for pickup at Lafayette or Saratoga in 3 business days. For delivery add up to 5 business days for delivery. For pickup in Mira Mesa, add 3 business days. Rush service may be available for an extra fee – please ask!